America evangelist and educator, Charles Finney was born at Warren, Connecticut, but two years later his family moved to upstate New York where he received his early education in frontier schools. As a young man he studied law and set up practice at Adams, New York. While reading Blackstone’s Commentaries On Law, he noted continuous references to the Holy Scriptures; Blackstone repeatedly mentioned the Bible as the highest authority. This moved Finney to buy a Bible and he soon was reading it more than law. The Word of God brought deep conviction to his soul, and on October 10, 1821, out in the woods, he was converted to Christ. He immediately began witnessing for Christ and before long was conducting revival meetings. Finney used the apostolic practices of the New Testament and was soon filling the largest buildings available and keeping them filled. 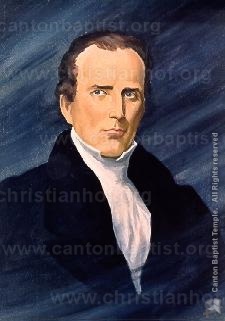 The highlight of his evangelistic ministry was the “nine mighty years” of 1824-1832, during which he conducted powerful revival meetings all over the eastern cities of Gouverneur, Rome, Utica, Auburn, Troy, Wilmington, Philadelphia, Boston, and New York. During his meetings in Rochester, New York, “the place was shaken to its foundations”; twelve hundred people joined with the churches of Rochester Presbytery; all the leading lawyers, physicians, and businessmen were saved; forty of the converts entered the ministry; and the whole character of the town was changed. As a result of that meeting, revivals broke out in fifteen hundred other towns and villages. He was finally forced to discontinue his evangelistic ministry due to bad health, and after many years as a revival preaching pastor in New York City, he became president of Oberlin College in Ohio where he lectured until his death. Over five hundred thousand people responded to his public invitations to receive Christ. Finney was personal, home-spun, dramatic, and forceful, and his revival lectures are still studied by Bible-believing preachers, teachers, and evangelists.